In an era of "alternative facts," these national parks are taking a stand. Badlands National Park in South Dakota is known for its raw, rugged beauty — the result of tens of millions of years of deposition and erosion — its majestic vistas, and its tranquil environment. But on Tuesday the National Park made the news for an unexpected reason when a former park employee got their hands on the National Park’s Twitter account. The employee, still unidentified, posted a series of climate-change related tweets in short succession, captured here in this screengrab by Buzzfeed’s Jon Passantino. “Today, the amount of carbon dioxide in the atmosphere is higher than at any time in the last 650,000 years,” the former Badlands employee tweeted, citing a fact that is objectively true. This small act of defiance was followed up on Wednesday by the Death Valley National Park Service, which began tweeting about the internment of Japanese-Americans during World War II. As of 4:40 P.M. EST, these posts remain on the National Park’s official Twitter feed. Over 100,000 Japanese-Americans were interned in camps during World War II, including at the Manzanar Camp in Southern California, which the Death Valley National Park Service explicitly referenced in its series of tweets. The initial catalyst for the National Parks’ tweetstorm may have been the social media blackout of the Environmental Protection Agency, ordered by the Trump administration, as well as a clean wipe of all climate-change related language from the official White House page. Within a few hours, the initial tweets were removed by the Badlands National Park, and a statement of apology was released the next day. “We regret the mistaken RTs from our account yesterday and look forward to continuing to share the beauty and history of our parks with you,” the official account tweeted. Afterward, Twitter users quickly filled the void. 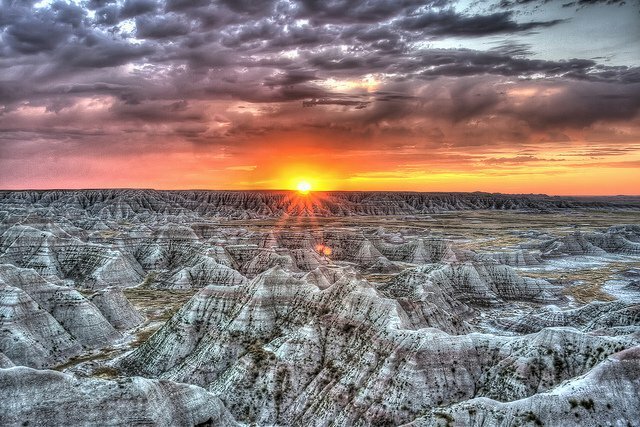 A fake Badlands National Park account was launched, and has already accrued more than 40,000 followers. Though, the initial Badlands National Park tweets only showed up on Twitter for a matter of several hours, the dust from the media storm it kicked up remains to be cleared. As for the Death Valley tweets, these have not yet been taken down. The backlash on the part of the National Park may have come in light of the Trump administration’s controversial policies toward Muslim immigrants, including a proposed Muslim registry that harkens back to the World War II internment camps. The White House responded to the flurry of political activity in a statement, AP reports, calling the agencies’ use of social media “inappropriate,” and vowing to address the incidents.